The Best iPhone Cases for Moms? What would we recommend? So what are the best cases for moms? To answer this question, we got help from one of the mommy bloggers that we know, Sarah Remmer from sarahremmer.com. Sarah is a mother of three kids and her blog is dedicated to healthy kid-friendly recipes and nutrition. Aaron sat down with Sarah to talk about some of the features that mom’s would be looking for in a case. Based on these criteria, here’s a list of durable, relatively slim, usable cases we feel that would be “mom” friendly. We’ll elaborate on the reasons why we feel these are kid friend cases below. If you need more options, check out the “Best of the Best” cases for the iPhone 6/6s and iPhone 7 and our Top 10 Guides for the iPhone 6 and iPhone 7. Sarah is quite fond of the Otterbox Symmetry. Her iPhone 6s has taken a beating in the case without anything happening to the actual device. From our perspective, the back of the Symmetry is a bit slick which reduces the one-handed usage of the iPhone and the case is quite large (when compared to other cases). The best part of the Otterbox Symmetry is their partnership with Zazzle which allows for custom printing on Otterbox Symmetry cases. Sarah mentioned to us that custom cases with her kid’s pictures on them look great but don’t offer much protection for the iPhone. The NuGuardKX is actually bigger than the Otterbox Symmetry. However, the extra size of the NuGuard KX translates into greater protection for the iPhone. We’ve personally dropped the iPhone in the case from a height of 11ft without any external damage to the iPhone. The standout feature of the NuGuard KX is the texture on the case. The entire case is covered in tiny bumps which greatly improves the handling of the iPhone, even when it’s wet. However, like the Symmetry, the bulk of the case is manageable with the regular sized iPhone 6/6s and iPhone 7 but becomes unwieldy with the larger Plus-sized iPhones. See what colors they have on (Amazon)! We didn’t talk specifically about the LoopyCase in the video but we feel the one-handed usability of the case is going to be very useful for younger children (older than toddlers). Why? because the moment their hands/fingers get into the loop, the iPhone isn’t going anywhere. It’s almost impossible to drop when there’s a finger (or fingers) in the loop. The biggest drawback about the LoopyCase is that it won’t provide as much protection as the other cases on this list. If you are planning on getting a Loopy, definitely get a non-glass screen protector to provide the most protection for your device. The LoopyCase would work well with any sized iPhone. If you are planning on getting a LoopyCase, make sure you use the code “MobileReviewsEh5” for $5 dollars off your purchase. This is one of Aaron’s favourite cases. He’s a big fan of the texture and handling of the iPhone in the Atmos X4. If he was to stop reviewing cases today, the Thule Atmos X4 would most likely be the case he’d stick with. The standout feature of this iPhone case is the Stratoshield screen protector (check out the video review for the torture test). This is one of the few cases where we’d be comfortable taking a hammer and striking the face of the iPhone repeatedly. 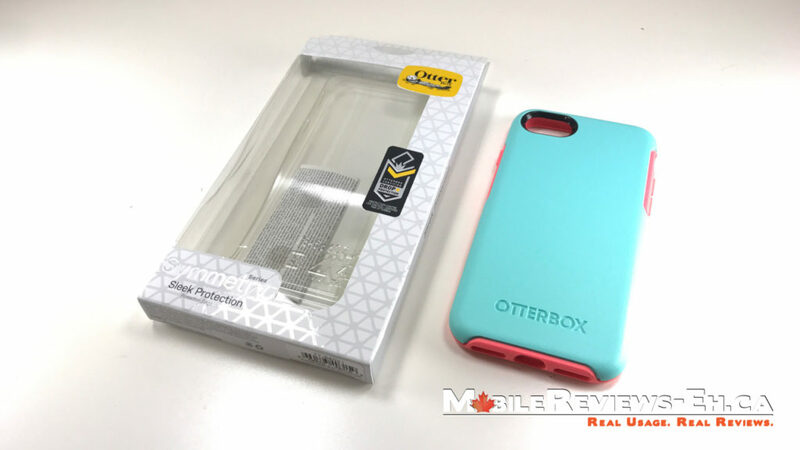 The screen protector has an adhesive back which eliminates the gap between other cases with screen protectors (like the Otterbox Defender). The Thule Atmos X4 will work well with any sized iPhone though we have heard of complaints regarding the size for the Plus-sized iPhones. Check out the different colors on (Amazon)! The Playproof is one of the lightest, yet tough cases we’ve reviewed. Like the Otterbox Symmetry, you can add custom images to the back of the case as well. If you want to see how much of a beating a Playproof can take, check out the 40+ drops we did in our torture test video! The back of a plain Playproof is quite slick which is a drawback for moms. Getting a case with a print will improve the handling of the iPhone in the case. Another attractive feature of the Rhinoshield Playproof is the offer of custom printing (or so we’ve been told) which is great if you want to get a tough case with a custom photo on it. The last thing we’ll say is that the plastic screen protector that Evolutive Labs sells is one of the toughest out there. It can handle multiple impacts and unlike glass, won’t chip or crack. The only downside is that fingerprints will be more evident but we’re sure the extra protection outweighs that downside. Head over to (Amazon) to see what they have or use the code “MobileReviewEh15” at www.evolutivelabs.com for a 15% discount! The last case that we talked about in our video is the Patchworks Level and you can consider it as the smaller sibling to the Newguard KX. While writing this, we actually realized that the Playproof would also be considered as the smaller sibling to the Newguard KX as well. The Patchworks Level is a thin, drop-rated case. From our review, it can handle a 6ft corner drop without any issues. The case, like the Playproof is a bit slicker on the back (if you get the clear version, the black version isn’t) so depending on how old your children are, your iPhone might suffer a few more drops than other cases. The last thing we’ll say is that the glass screen protector from Patchworks, the ITG Silicate Glass is one of the toughest glass screen protectors we have used. The one shown in the review video has been re-used at least 6 other times and it still has broken yet. Get the Patchworks Level on (Amazon)! So those are the best cases iPhone cases for moms, based on our conversation with Sarah Remmer. If you’re looking for recipe ideas, child nutrition and other parental advice, definitely check out her website at www.sarahremmer.com. If you have questions for us about the best iPhone cases for moms, leave them in the comment section below! We were wondering what the best iPhone cases for mothers were. So we got some help from actual moms! With the help of Sarah Remmer, we came up with three criteria to help moms choose the best iPhone cases for their devices. Are any of the best cases for mom water resistant? My 8 month old is currently teething so she is constantly trying to put my phone in her mouth or drooling onto the screen. Of course her favorite part to get wet in the speaker for the ear. Any advice on cases would be greatly appreciated!